[ @Pixar #RenderMan ]Pixar has announced for the first time, RenderMan now ships with the same shaders & lights used at Pixar, the very same that created Finding Dory … providing all RenderMan artists access to Pixar’s toolbox for lighting and look development, real tools that have already created amazingly sophisticated and complex imagery for feature film. In addition, this major release represents the maturation of the RIS rendering framework, which has been tested and proven on feature films such as Jungle Book and Star Wars: The Force Awakens, establishing RenderMan as the most advanced rendering platform currently available. Developed specifically for animation and VFX, this release is focused on expanding the creative horizons for storytelling while continuing to raise the bar for performance and quality. RenderMan is now more than just a renderer; it is a complete shading and lighting ecosystem, more powerful, accessible, and comprehensive than ever before. -Now you can get production shaders from a major studio out-of-box for your own projects, straight from Pixar Animation Studios … no development required. 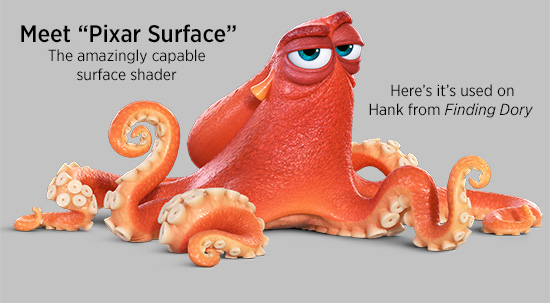 Not only are these shaders fine-tuned for the highest level of performance, they also come fully loaded with all of the creative options for look development demanded by the shading artists at Pixar. Use Pixar Surface to create everything from glass to the most incredibly subtle skin you can image … and layer them on top of each other, for unlimited types of looks. The new Pixar Displacement was written for the RIS framework, and supports advanced features, like 32bit vector displacements. With Pixar’s Marschner Hair dial in realistic (or fanciful) hair, with features not available in other models, but quite common in the real world, like luminous backscatter. -RenderMan’s lighting system has been completely rewritten to deliver the highest performance possible on today’s modern hardware, and includes innovative techniques for artifact suppression and new methods for increased efficiency. This new library of physically based lights offers standard features like color temperature, exposure, and IES profiles … but also includes specialized Light Filters which have been developed for feature film in collaboration with Pixar’s lighting TDs, allowing light to be quickly stylized in any number ways, offering a multitude of new creative possibilities. -The new library of physically based materials shipping with Pixar Surface makes it easy to dial in any type of material: plastics, metals, ceramics, rocks, liquids, and more. 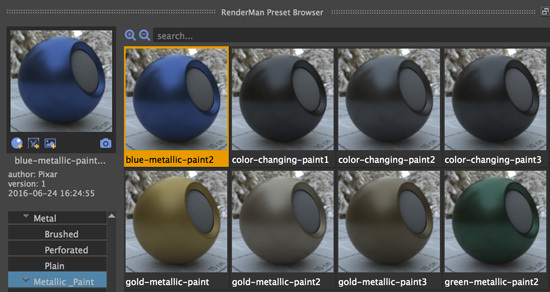 Materials can also be browsed, created, and shared with the new Preset Browser in RenderMan for Maya, a helpful tool for managing shaders, lights, and textures. -Create new types of looks quickly with RenderMan’s expanding suite of advanced patterns for real productions. Use RenderMan’s new Pixar Dirt pattern manipulate and blend textures to create many different looks, including dirt, dust, and patinas (leveraging ambient occlusion). The now essential Pixar MultiTexture lets you attach one shader to many surfaces, and have that shader behave uniquely on each of them. Finally any complex pattern can now be baked to a 2d or 3d texture using Pixar BakeTexture & Bake PointCloud for later reuse, and there are more patterns to explore. -RenderMan has been greatly simplified, and the interface for RenderMan for Maya has been redesigned accordingly. Now that the RIS Framework has been fully embraced, all legacy attributes and options have been removed (everything related to the now deprecated Reyes), allowing artists to focus less on knobs and levers and more on the creative process. -Developed by Disney for Big Hero 6, the Denoiser was used with amazing success on Finding Dory where the average frame saw 10x speedups. 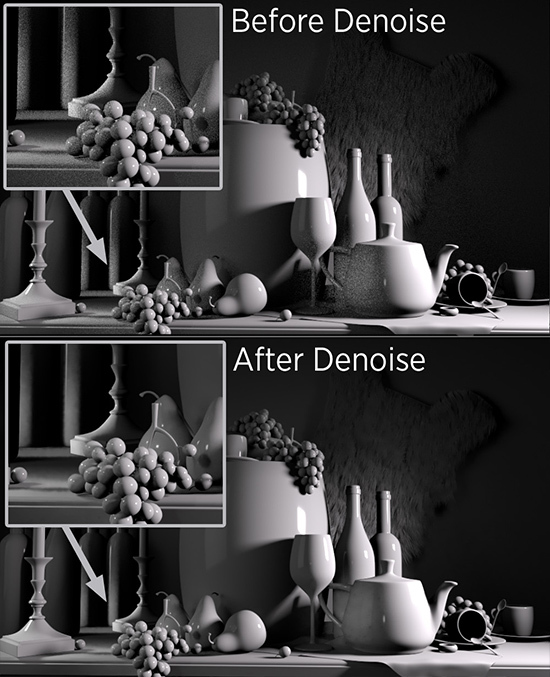 Now the Denoiser gets upgraded with several new features. For Zootopia, Disney optimized the Denoiser to handle lots of fur and hair, while at Pixar the Denoiser was extended to support GPU acceleration, reducing the time required to denoise a feature film frame to seconds. -RenderMan is fully capable of delivering high resolution animation for VR, including the new omnidirectional stereo for rendering left and right images for immersive 3D experiences. Simply render with the VR camera. RenderMan can be purchased by contacting rendermansales@pixar.com or through an authorized reseller. Existing customers with a maintenance agreement are entitled to a free upgrade. 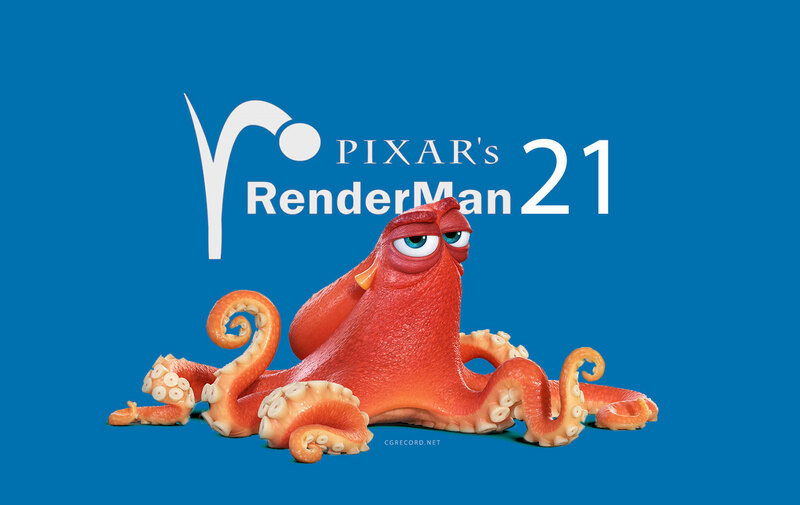 RenderMan 21 will also become available free of charge at a later date to individuals for non-commercial use. RenderMan is compatible with the following 64-bit operating systems: Mac OS 10.11, 10.10, and 10.9 and, Windows 10, 8 and 7, and Linux glibc 2.12 or higher and gcc 4.4.5 and higher. RenderMan 21 is also compatible with versions 2015, 2016, and 2016.5 of Autodesk’s Maya, with version 2.0, 2.1, and 2.2 of The Foundry’s KATANA. Compatibility with Side Effects Houdini version 15.5, version 2.77+ of the Blender Foundations Blender software, and Maxon’s Cinema4D version 17 will be announced shortly.